MANILA, Philippines – The years leading up to the historical 1986 People Power Revolution were turbulent times for the country: late dictator Ferdinand Marcos, with his iron-fist rule, stayed in power for 20 years and imposed martial law for 9 years. Those years saw numerous atrocities committed against thousands of Filipinos, especially those critical of the Marcos regime. But hope was not lost among brave men and women who joined the resistance movement – either in the streets or underground. 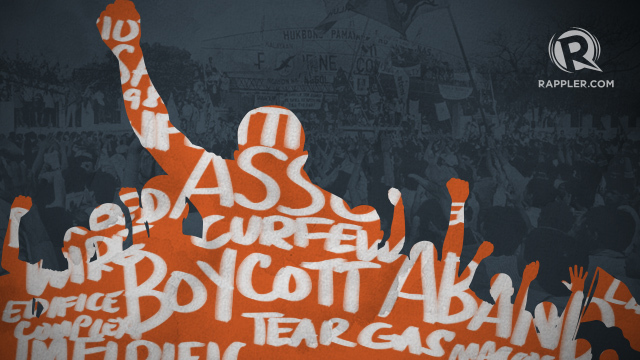 With free speech curtailed, activists communicated their anger in more ways than one. What words and phrases peppered their conversations then? Below are some of the words that comprised the activists’ lingo in the 1980s, based on research and interviews with historian Michael “Xiao” Chua and Aurora Batnag, president of the Pambansang Samahan sa Linggwistika at Literaturang Filipino. Barbed wire – Activists then considered the barbed wire as a symbol of oppression. At the time, gates of Malacañang in Manila had barbed wires, keeping protesters away from the seat of power. 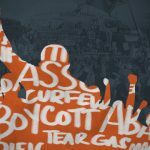 Boycott – The act of boycott in the context of the martial law could mean two things, said Chua: to boycott an election that is “Lutong Makoy” (an election rigged by Marcos), or to boycott products, banks, and companies owned by Marcos’ cronies. 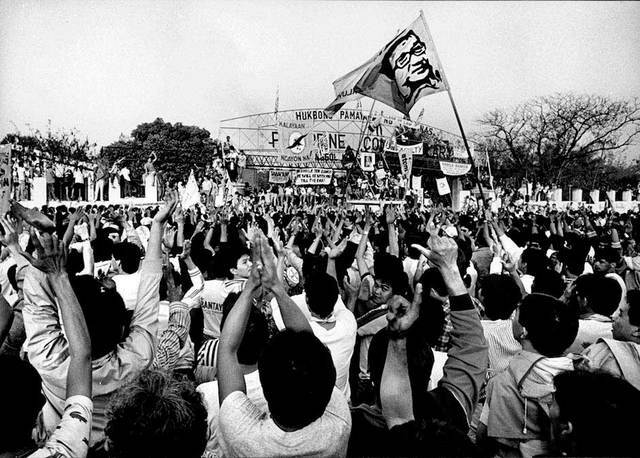 Confetti – Rallies in Makati’s Ugarte Field (now Ayala Triangle) were replete with yellow confetti – that is, yellow pages cut into strips of paper and dropped by employees from their offices to support protesters against Marcos. Curfew – The 12-4 am curfew hours during martial law lasted for 5 years, from 1972 to 1977. Chua said another term related to curfew is “pa-morningan,” when people would rather stay where they are past midnight than risk going home. Edifice Complex – This term used by stage and screen actor-director Behn Cervantes is a play on another term, Oedipus complex, and refers to Imelda Marcos’ penchant for building extravagant infrastructure projects for the arts. This includes the Cultural Center of the Philippines, the Folk Arts Theater, and the controversial Manlia Film Center, which collapsed while still under construction. Imeldific – This term, a play of the First Lady’s name, was used to refer to being extravagant and vulgar. But Chua said Imelda herself claims the term and interprets it to mean “excessively beautiful.” During his interview with the First Lady, Chua recalled that Imelda even referred to her dog as Imeldific after it ate caviar. Metrocom – One of the most feared words then, according to Batnag, was the Metrocom or the Metropolitan Command – troops who detained anyone who’s still out in the streets past the curfew hours. Operation Pinta-Operation Dikit (OP-OD or Operation Paint/Post) – This refers to “missions” wherein activists filled walls and the streets with anti-Marcos slogans. Salvage – This term was used back then when referring to extrajudicial killings. Tear gas – During rallies, police would resort to using tear gas just to disperse protesters. Yellow ribbon – Inspired by the song “Tie a Yellow Ribbon ‘Round the Ole Oak Tree,” supporters of Marcos’ political rival, Senator Benigno Aquino Jr, tied yellow ribbons around the airport to welcome his return from the United States in 1983. He never saw the ribbons, though, as he was shot dead upon arrival. Chua said the yellow ribbon eventually became the symbol of Aquino’s wife Cory and the anti-dictatorship struggle. One important word is missing above: Magkaisa. In separate interviews, both Chua and Batnag said magkaisa is that one word which best defines the generation that fought the Marcos regime. Of course it’s also the theme song of the EDSA People Power Revolution – a peaceful revolution that toppled a dictatorship. Batnag also joined the protests then, with her children in tow. There were threats she would lose her job at Surian ng Wikang Pambansa (now Komisyon sa Wikang Filipino) for supporting Cory, but she said even before the snap elections, the country was already very ripe for a revolution. Only a few of the words above remain familiar to the generations that never experienced martial law. But the words are still relevant and worth revisiting today, according to Chua, because these words meant life and death to many. “But a lot of these words also symbolize hope for a better future. Pondering on the meaning of each word also makes us realize the journey that our fathers and mothers went through during that time to regain our freedom,” he added. For Batnag, it’s also another way to move on from that painful part of our history. Both Chua and Batnag also warned millenials about the dangers of forgetting what happened during those tumultuous times. “People often say that ‘Never Again’ is politics. Bongbong Marcos is saying that ‘Never Again’ is a propaganda against the Marcoses. But a lot of people don’t realize that ‘Never Again’ are lives lost, ‘Never Again’ are lives that are destroyed…. ‘Never Again’ is dignity lost,” the historian said.